Here is where you can take some creative licence depending on your taste preference. – Apple and cinnamon – add 2 diced apples, 3 tsp cinnamon, 1 – 2 tbsp brown sugar or maple syrup depending on the sweetness of your apples. When using a really sweet apple I have left the sugar out completely in the past. –Peaches and Cream – 2 – 3 sliced peaches, 2 tsp cinnamon, 1/2 a tsp ginger, 1 – 2 tbsp brown sugar or maple syrup. Add milk or cream to your bowl when serving. –Pumpkin and Spice – 1 cup pumpkin puree, 2 tsp pumpkin pie spice, 2 – 3 tbsp brown sugar or maple syrup. Once you have all your ingredients into the pot you will set your slow cooker on the low for 8 – 10 hours. I will usually put this together right as we are heading to bed. When you wake up in the morning breakfast is ready to go and your house smells like you have been slaving away all night. Overnight oats topped with fruit and a tbsp of peanut butter. My husband likes raw overnight oats that are soaked in milk and topped with nut butter and fruit. I find the oats a little hard to digest this way and you really need to use quick oats when making them that way. 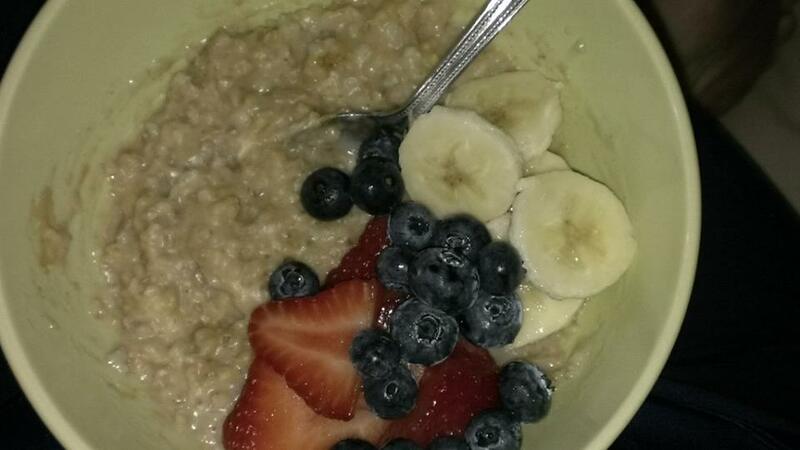 Let us know your favorite way to eat oats! Enjoy.